The Estonia national football team in international football and is controlled by the Estonian Football Association, the governing body for football in Estonia. Estonia play their home matches at the Lilleküla Stadium in Tallinn, Estonia. 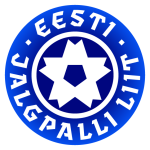 Estonia's first match was held against Finland in 1920, being a 6–0 defeat. The team participated in the 1924 Olympic Games tournament, their only participation. Estonia have never qualified for the World Cup or European Championship. The team have however reached the Euro 2012 qualifying play-offs, by finishing second in their qualifying group, before being drawn up against Ireland for a play-off tie, making 2011 the Annus mirabilis of Estonian football. In 1940, Estonia was occupied by the Soviet Union and did not regain independence (and the possibility of a national football team) until 1991. Estonia's first FIFA recognised match as an independent nation after the break-up of the Soviet Union, was against Slovenia on 3 June 1992, a 1–1 draw in the Estonian capital city of Tallinn. The record of the most international caps by an Estonian international (157), is held by Martin Reim, who held the European record in 2009 until November of that year. The record of most goals (38) is held by Andres Oper. The national team head coach has been Magnus Pehrsson since December 2013.